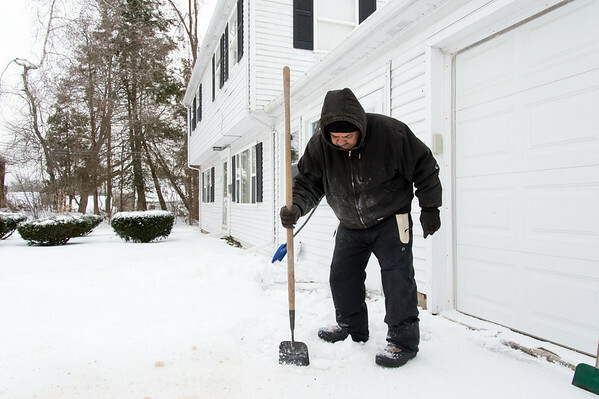 NEW BRITAIN - From brutal cold to icy roads and scattered power outages, many Connecticut residents took advantage of the Martin Luther King Day holiday to hunker down at home on Monday. A few motor vehicle accidents were reported in the New Britain area during the snow and ice storm this past weekend. New Britain police had nothing to report relating to storm activity, Deputy Chief Chris Chute said Monday afternoon. However, more than 230 vehicles in violation of the parking ban were issued tickets and towed as of 4:50 a.m. on Sunday, according to Mayor Erin Stewart. New Britain Fire Chief Raul Ortiz echoed that sentiment saying downed trees and wires were not an issue during the storm with no reported power outages. Because of the icy conditions that began on Sunday, continued on Monday and were expected to extend into today, any fire was automatically going to be upgraded to a second-alarm, Ortiz said, which means an extra engine and ladder would be called to the scene. In Berlin, minor car accidents were reported, Matt Odishoo, deputy fire marshal and emergency management director, said. A couple of downed wires and one tree was reported down on Norton Lane, he said, but that was likely from a branch hanging over the wire, touching it and catching a spark, he said. Plainville saw five accidents with no injuries and Southington had one minor parking lot mishap. AAA spokesperson Amy Parameter said the company responded to a number of calls on Sunday, but saw a spike in responses on Monday because of the cold temps affecting car batteries. About 1,600 calls for service were made to the auto club by 2 p.m. she said with about half of them for dead car batteries. About 30 percent of the calls resulted in the vehicles being towed. In terms of power outages, Eversource spokesperson Frank Poirot said the peak of customers out of power at the same time was 20,000, mostly concentrated in the central Connecticut area near Middletown. Downed wires from tree branches falling from ice and snow accumulations coupled with winds, caused a lot of the outages, Poirot added. Workers having to deal with the downed trees in the roads, which were icy, and the cold temps added to delays in restoring power, he added. An Eversource subcontractor was killed by a falling tree in Middletown around 3:20 p.m. Sunday when repairing the line, according to the Associated Press. Schools in New Britain were closed on Monday because of the MLK holiday and will also be closed today due to the cold temperatures. Posted in New Britain Herald, Berlin, General News, New Britain, Plainville, Southington Herald on Monday, 21 January 2019 19:33. Updated: Monday, 21 January 2019 19:36.